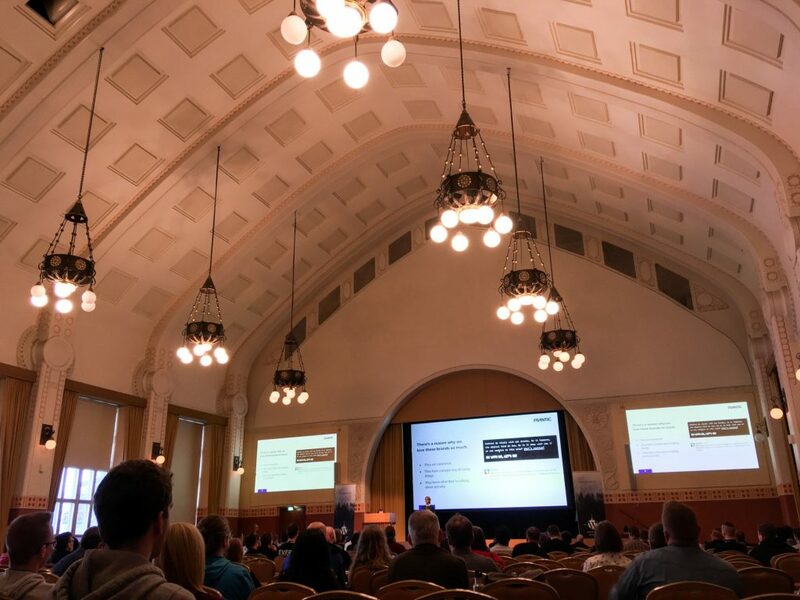 For me WordCamps are always a good reason to travel. Meeting new people and getting to know new places. 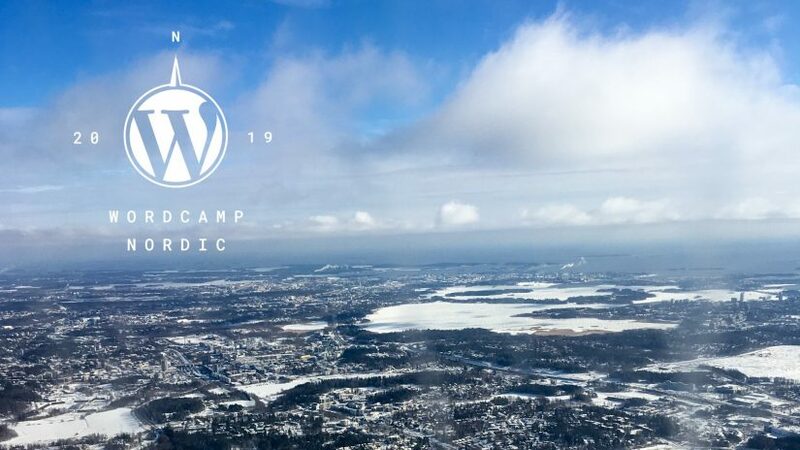 A trip to Finland for WordCamp Nordic was a great vehicle to also finally meet up with old friends I know from CoWorkingCamp in Turkey. 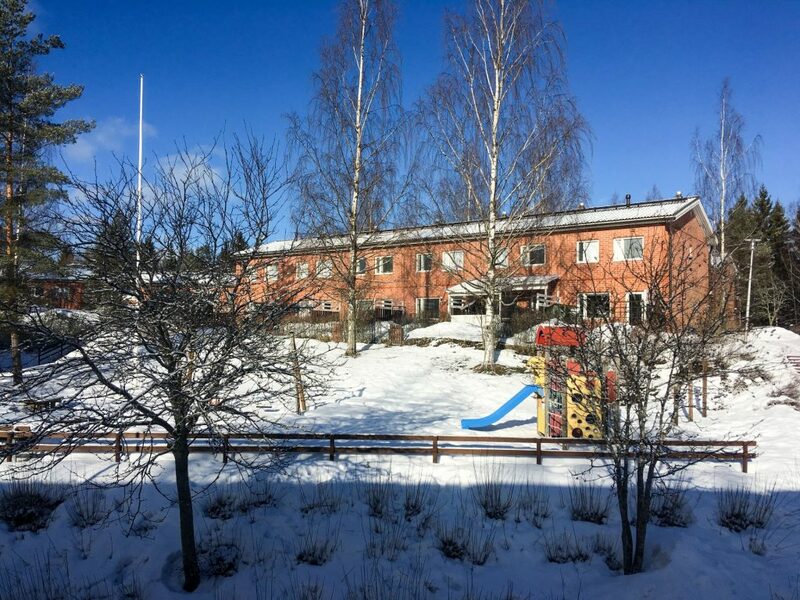 Even as not all plans about timeing and things to do worked out I had a great week visiting the winter up north in Finland. My traveling started early in the morning to get to Hamburg. Having breakfast in a still quiet and relaxed Airport. From HH I took airBaltic over Riga to Helsinki. 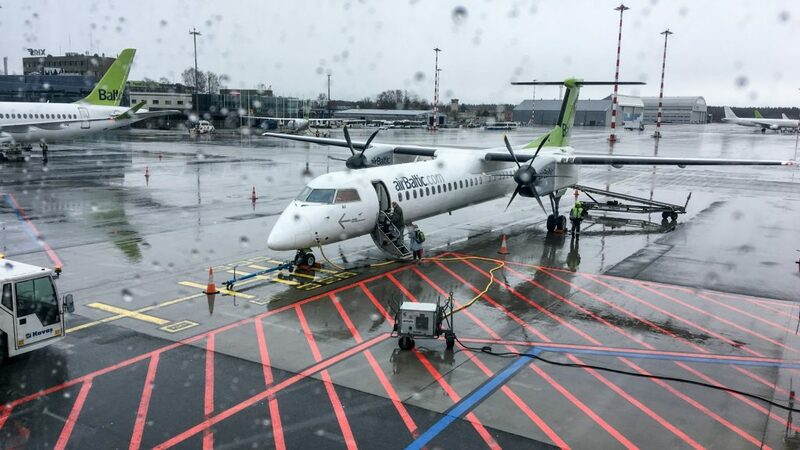 I like the small Bombardier Dash 8 planes the airline operates. Inside everything looked pretty much new or it was really well maintained. One thing that I noticed was that the announcements from the flight crew were clear and in a very good english. Easy to understand for people not able to speak the language of the airline. I didn’t have a direct connection. Have seen during the booking that the time in Riga wasn’t very long. But I didn’t expect it to be so very short. After touchdown I went into the bus to the arriving gate. Walked to the departure gate and back on the next flying machine. Finding myself on the same seat, just one plane over within maybe 10 minutes or so. 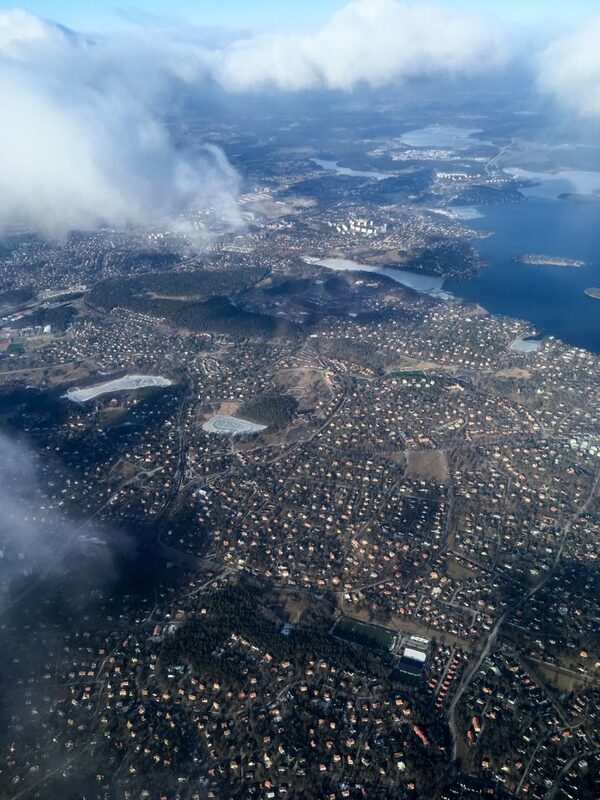 Short time after take off we approached Helsinki Airport. I could already see the runway below myself. Suddently the engines powered up again to cancel the approach. Don’t really know why but the extra loop allowed me to spend more time looking at the landscape and take more photos. You can see the lakes between the forsts and the vast city area on the photos above. After all we landed safely. The taxiing took a long time and the area of the aiport looks huge. I picked one of the busses to go to the city center. 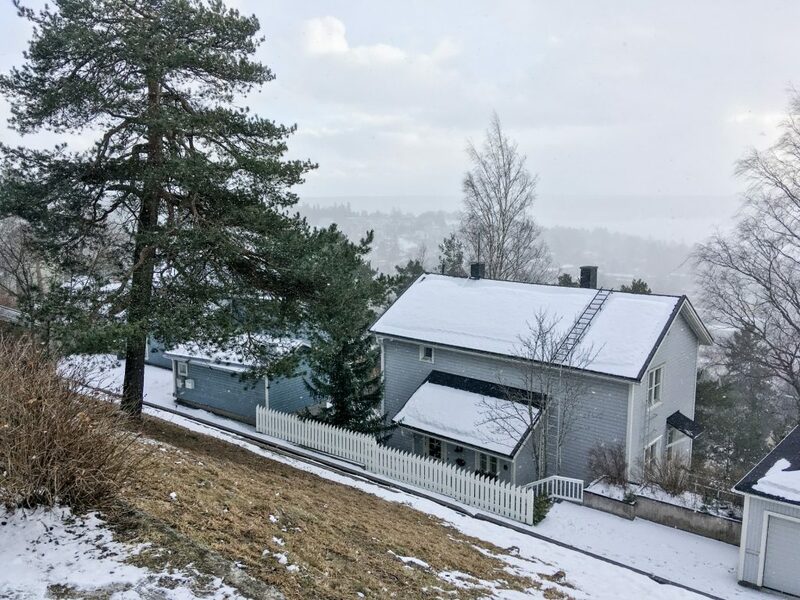 I shared an AirBnB close to the WordCamp venue with two friends. 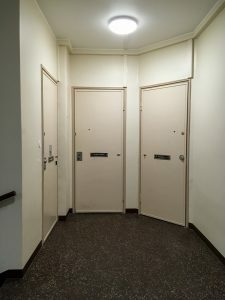 The apartment usually is occupied by a family with a kid. To our enjoyment some LEGO toys and Star Wars books have been there. As in every country many small details differ from what you know from home. 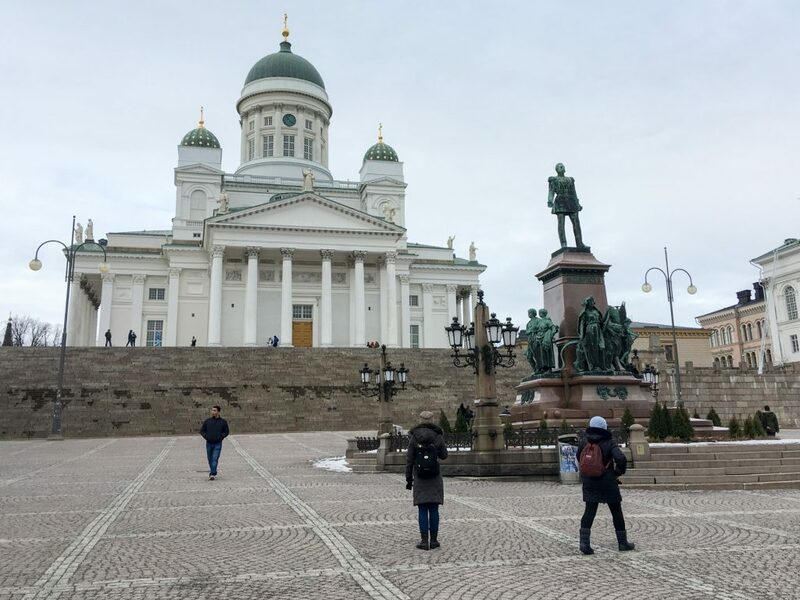 I noticed that buildings in Helsinki are very big. Not necessary tall. One difference sticking out for me was the look of the doors to our apartment (see image). It remind me of doors to cells in a jail. Also the door bell and keys where strange to me. The food prices at the airport were quite pricy so I skiped eating after arriving. Still hungry I went for lunch in one of the many asian restaurants close to our accommodation. 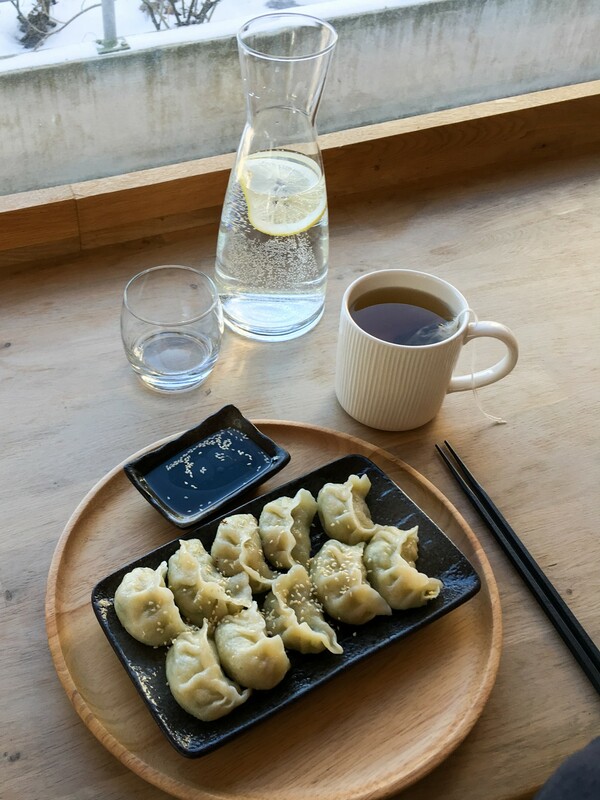 I went for the lunch deal of handmade dumplings and a hot tea. For a reasonable price of € 12,50. Not to far from what I’m used to from Hamburg. The layout of the shop differs from what we know from Germany. There where even some of the same products with german main writing on it. Seeing the finish design for simple things like milk or pasta was interesting. Also we couldn’t find some things we wanted to buy that seam to be “german things” and not on the shelves international. During visites to other finish supermarkets the other days I noticed that inside this stores the temperature is quite low. I was at times happy to have a jacket on me inside. The next day started as for many people. Breakfast and working as every day as a digital nomad. Working from a new desk always take a bit to get used to, but things need to get done anyway. 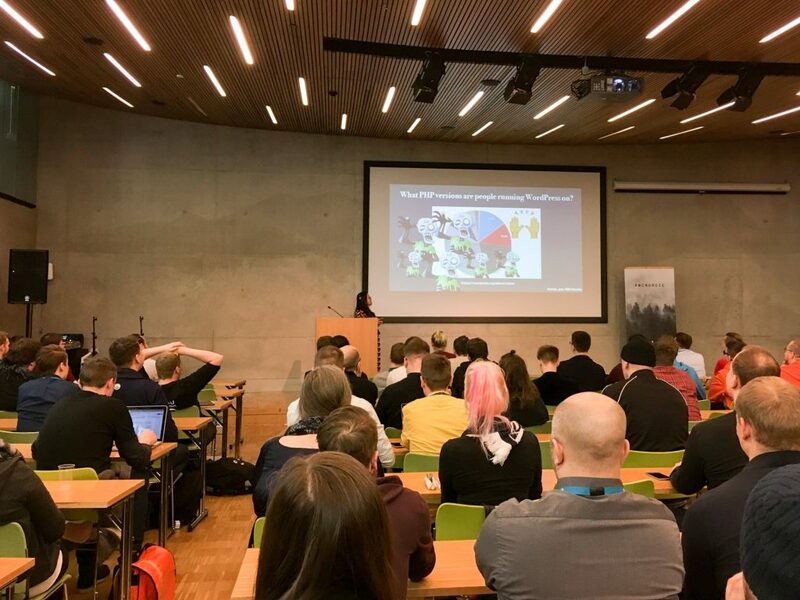 With every hour we got closer to the event we where in Helsinki for. To kick off the internationa gathering there where a Warm-Up-Meetup in a local beer bar. As usual it doesn’t take long until you find yourself in discussions about technical or conceptional WP questions with new and old friends. The one thing definitely more expensive are alcoholic drinks. A beer from € 7,50. The good thing for me was that beside beer there is a big selection of sider. I love siders. I tried a finish beer and a blueberry sider. As the evening continued some groups went on from drinking to also eating. Went along and we had some midnight meal at a mexican place with very tasty, high quality food. Also here I couldn’t complain about the price. You know there is a WordCamp in town if you walk into a restaurant and you meet a table full of other WordPress people. 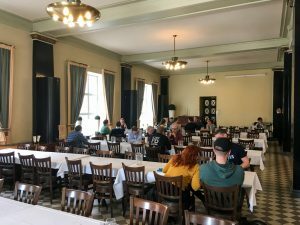 More or less all WordCamps have a contributor day as part of the event. This time the day was before the conference day. After learning to create Gutenberg Blocks on my own for a bit I joint the group of people talking about how to create custom blocks. Hands-on learning guided by Sören. My favorit part of the lunch have been the pancakes with icecream, cream and red fruit jelly. Learning here: it’s a thing coming from sweden and common in the army to serve pea soup and pancakes on thursdays. Starting of with drinks sponsored by WPEngine. 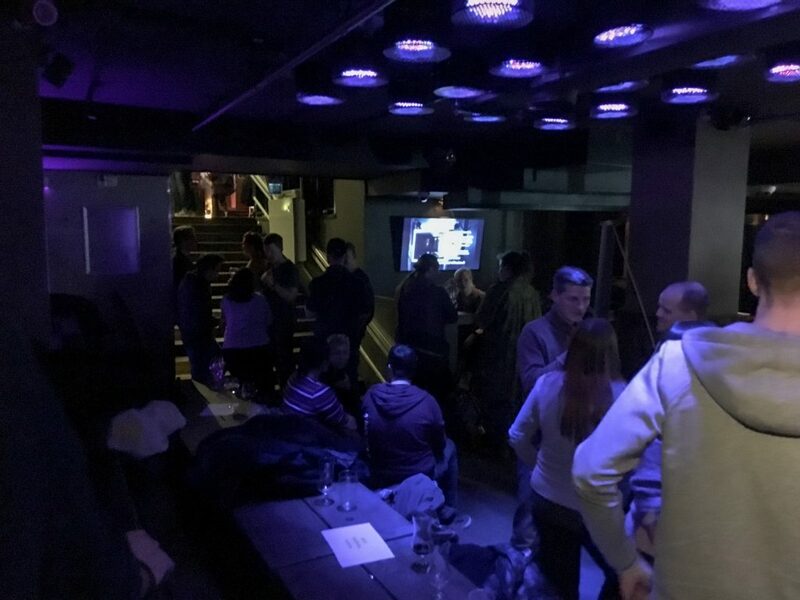 In a bar packed with jung people some discussions from the contributor day have been deepened or new contacts have been made. Contributing and drinks are not evening filling. To fill the stomach I went for burger in a recently opend local chain with a mixed group of WordCamp attendees. Well feed we started the slippery walk through the nightly city center to the “main hotel”. Slippery not because of the discussed topics. More because of the slushy, water snow mix in the streets. A few drinks at a hotel bar later the first full day of WCNordic finishes. 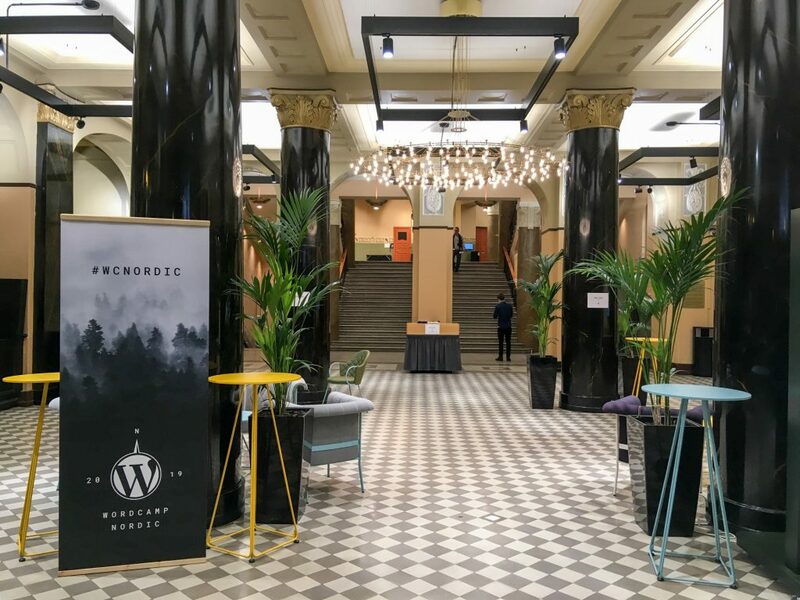 Excited for a brand new WordCamp we start into a day packed with talks and talking to new people. The venue is a lovely looking old building. The big staircase allows moving between the floors that host the different zones. Main Stage on top in the sumptuous hall. Sponsor area all over the staircase until you reach the lowest level where the second stage was. During the day I moved back and forth between the two stages to see a nice mix of topics. Well picked and good quality. For lunch I end up in the classic looking restaurant inside the building. The food was a mix of I guess local dishes and a well made salad bar. 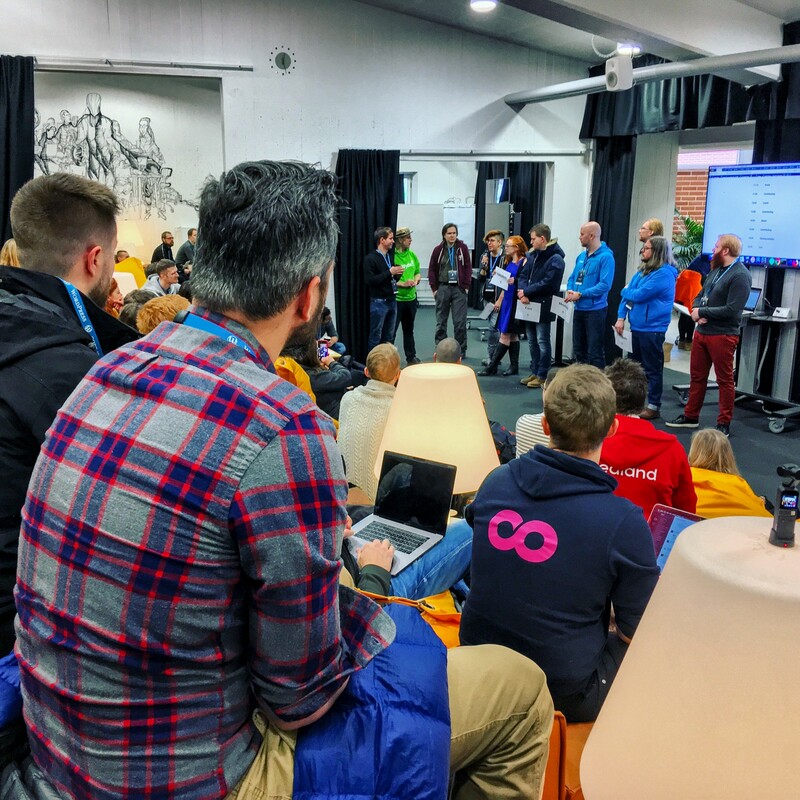 The third day of the Camp is a new thing for regional WordCamps to show the foren attendies around and tell about the city and culture of the hosting city. I liked the whole idea to provide a city or nature tour after two days inside looking at screens and projectors. Because of my limited time I joined the group for a city tour incl. the museum of national history. I learned even more things. Small details about how the country differs from the other nordic countries. 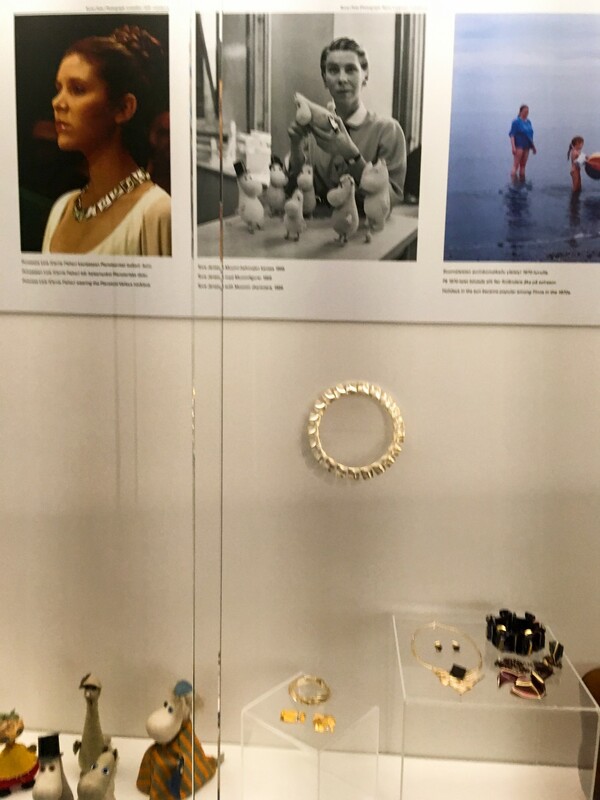 From the history of beeing swedish and russian until modern jewelry and fantasy Figures a lot of us have seen. 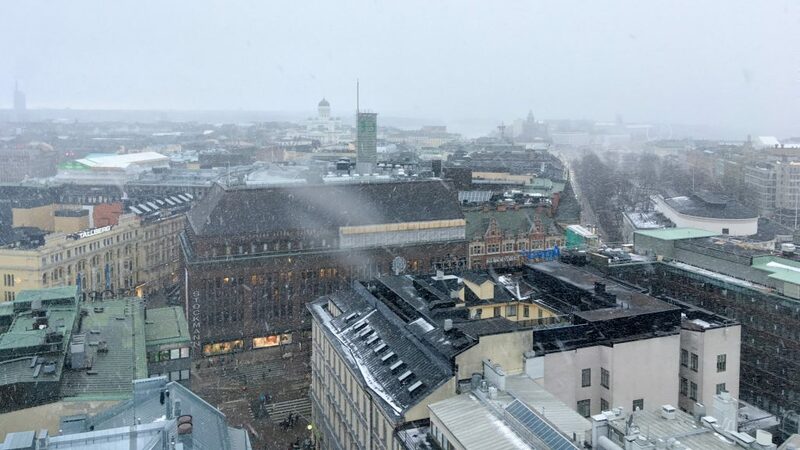 The last thing I did of the city tour was to get to the top of the Torni-Hotel and haveing a coffee with a view over Helsinki enjoying a pricy coffee. You pay for the view. 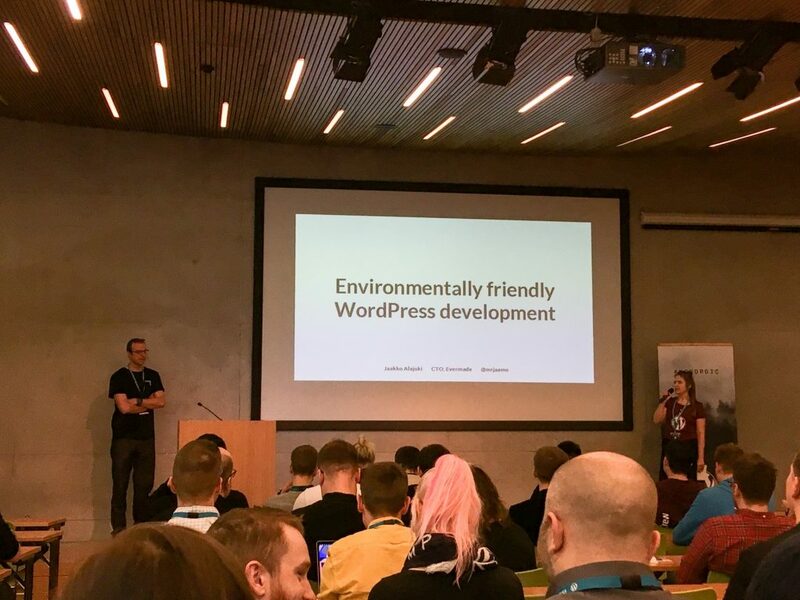 To the organicing team of WordCamp Nordic: Well done! Leaving the activity day a bit early I meet my friend. 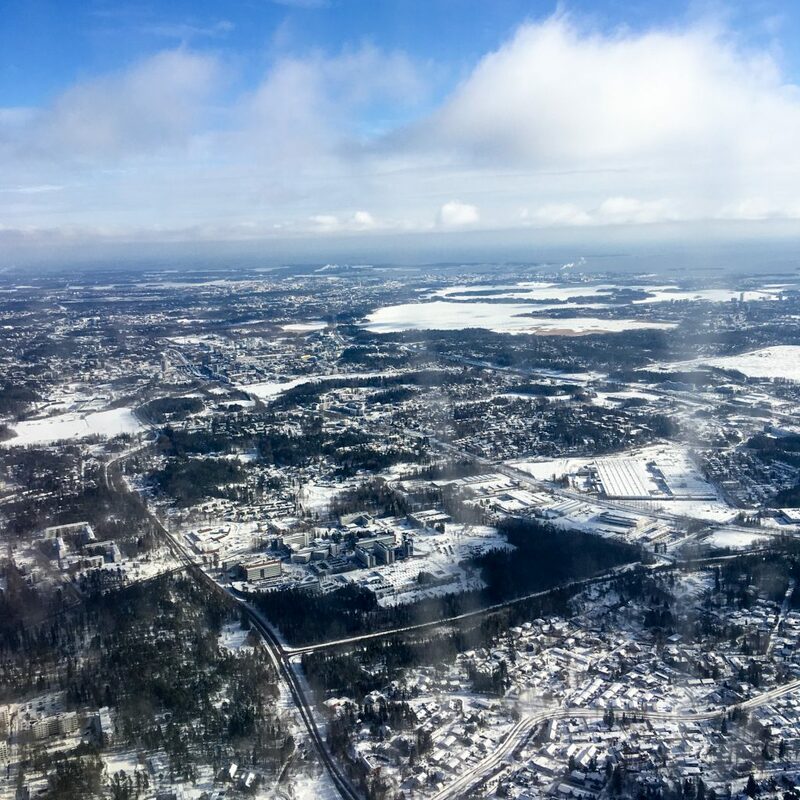 She was traveling through Helsinki anyway so we shared the ride to Tampere. 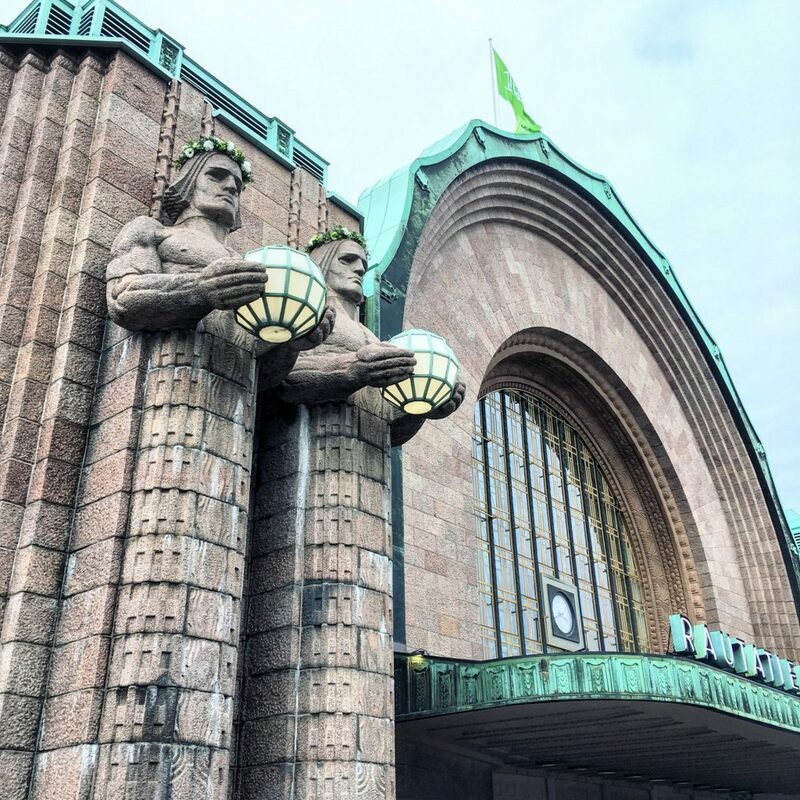 It’s the third biggest city Finlands. For the sunday I wished to get to know all kind of finish things. To do that we gathered with more finish friends and started another city walking tour. But first coffee! Therfore we went to the next Skybar on top of another Torni-Hotel. It was awesome to meet Mirje & Antti again after a while. And spending time together after we 4 meet a few years ago in a warmer place. The city is located between two lakes. In winter these freeze and it’s possible to walk and even drive on them. Something I have done in small scale but not on a body of water that size. Not visible on the photo there is a cafe next to a lighthouse out on the lake. 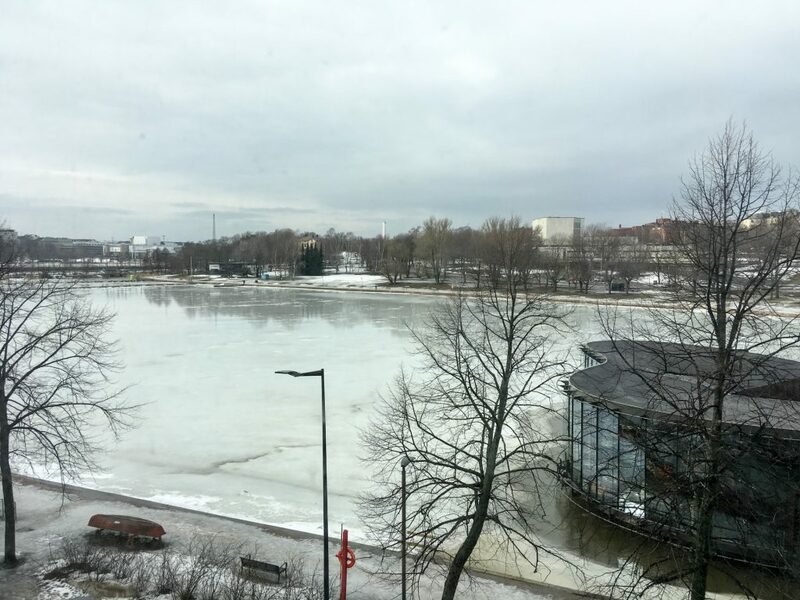 There are ways prepared for ice skaters to move all over the lake. Big parts of the city are old industrial buildings that have been or are converted into lofts or offices. I like that a lot. The last big factory remaining in the city center is one big paper mill. All around it the city developed lovely places to spend time outside in summer next to the water. Some floating and stationary saunas are also to find netxt to the city center. After actually walking on the frozen big lake and a tour around the more rual and older parts of the city the most important finish tradition was on the list. Going to the sauna is a completely normal thing in Finland. 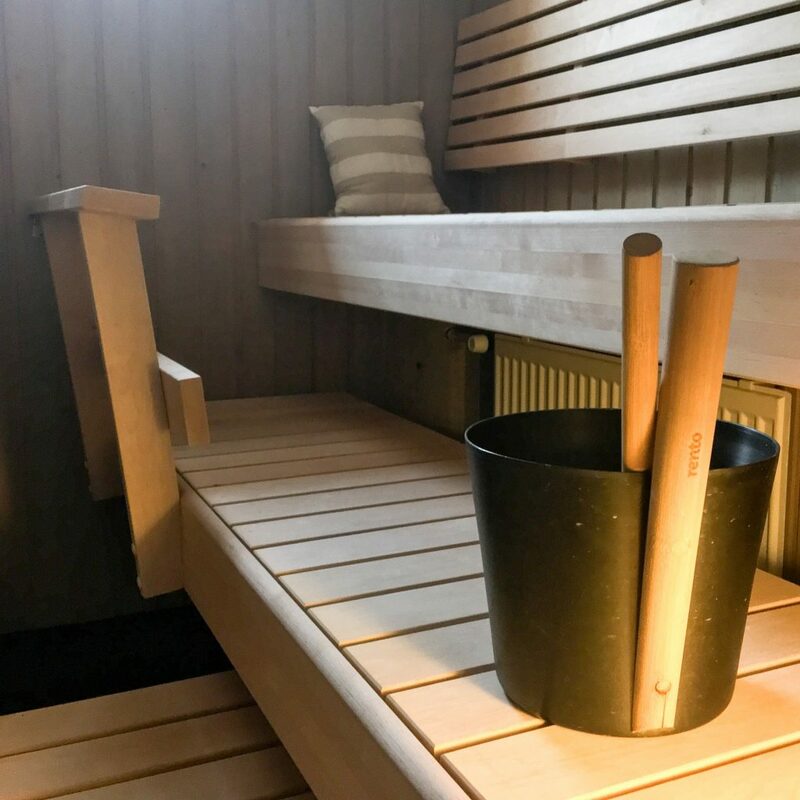 There are public, half-public saunas but also “every finish house” has a sauna. Of cause the place of my friend has one. Not the whole package with a bath in a frozen lake but the snow outside did a good job cooling me down after the heat. 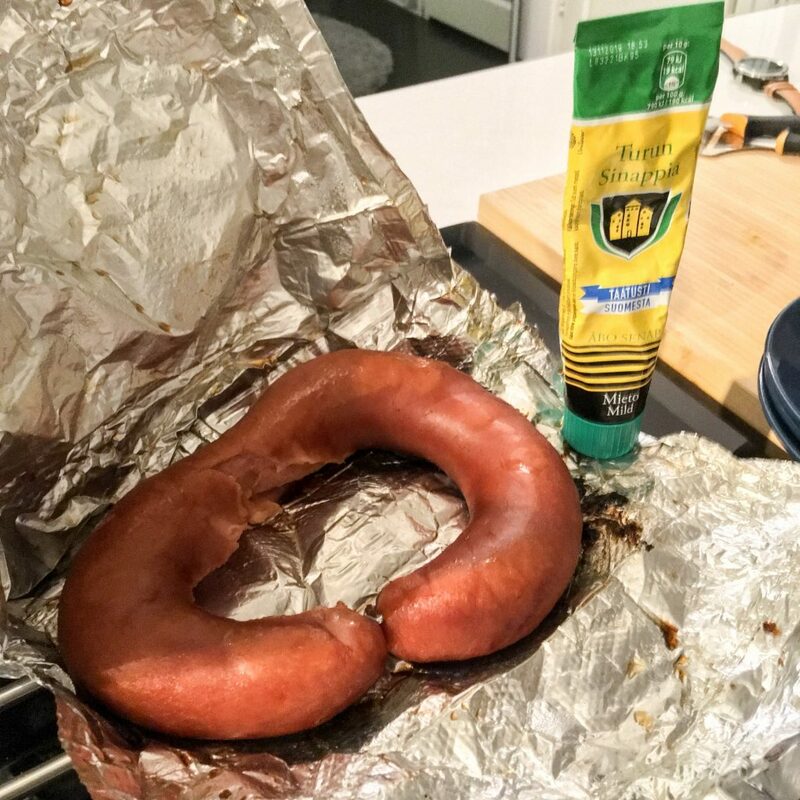 To fullfill my wish to experience typical things we had sauna sausage. A dish cooked on the hot stones while you visit the sauna. Thank you Jenni for hosting me, showing me around and sharing some of your traditions. At thte start of the new week I needed to get back home. So I took the train back to the capital. Not the newest train, but well equiped with power outlets, USB and well working WiFi. 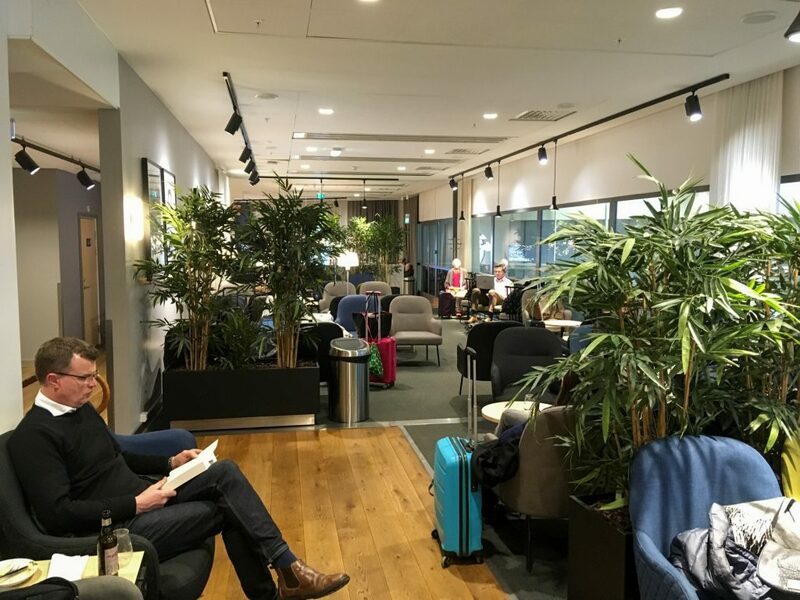 After the super quick stop-over on the way out my stop at Stockholm was a bit over 2 h. So I went to the SAS lounge to eat lunch and make use of the time at the airport. I always prefer the food on ground as the food served in the plane. 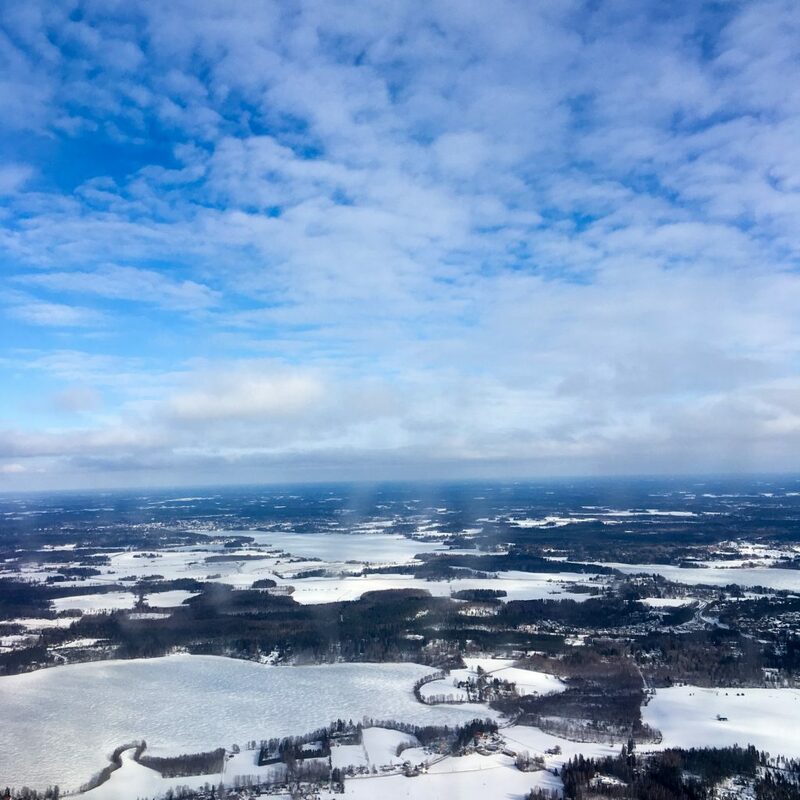 This was my trip north. This is how I got a week of snow and winter. Something we didn’t had at home this year. I enjoied this trip a lot to a new country and new culture in a while. Want to go back another time in summer to see the hundreds of lakes and cabin life. 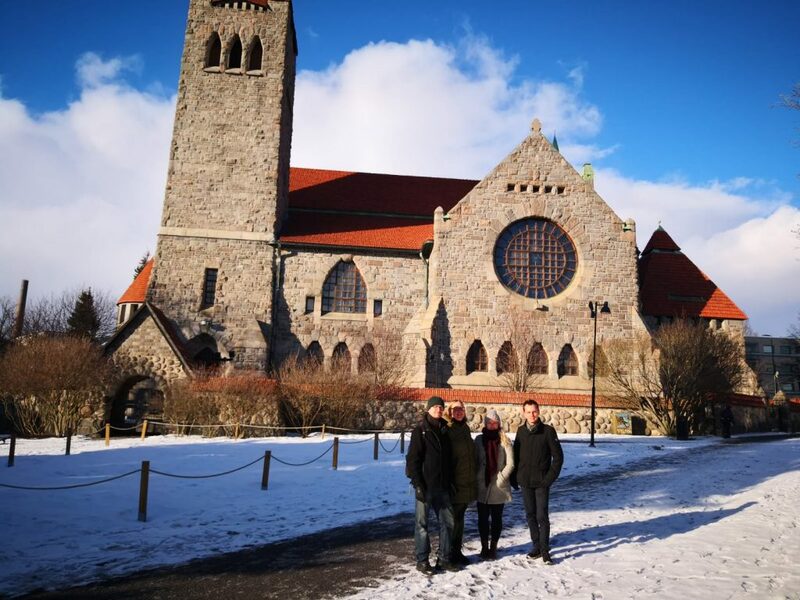 Love hearing about your travels Ralf – and love that you caught up with Mirje & Antti – I miss them! Hope all 3 of you are doing amazingly well! Maybe I will catch up with some of you in Bali this year.